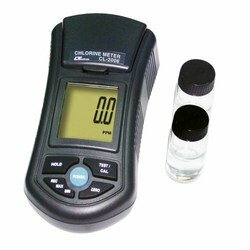 * Free chlorine, total Chlorine measurement. * Range : 0 to 3.5 mg/L (ppm). * Range : Auto range. * Measuring principal : Photo meter method. * Light source : LED, 525 nm. * Record Max, Min. value. * 10 PCs Free and Total powder DPD are included. * The measuring method is an adaptation of the USEPA Method 330.5 and Standard Method.